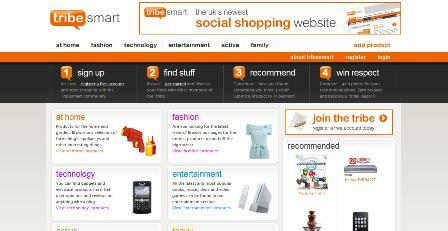 Launched in beta earlier this month, Tribesmart is a social shopping website which aggregates products and user reviews. With a lot of categories on offer, and large amounts of products to display, homepages on shopping comparison websites can often be very cluttered and potentially confusing for users. Tribesmart manages to avoid this trap though, and has created an attractive homepage with clear navigation options. There is one issue here though: the four-step instructions for registering and getting started may be useful for first time visitors, but once you have logged in and learned how the site works, this space would be more useful for navigation or product promotion. The navigation options are excellent here, and very simple to understand. There are six categories across the top of the page which lead into the different sections of the site and open up sub-categories. The labelling of the categories may confuse some users though; the fashion, entertainment, technology and home labels are clear enough, but ‘active’ and ‘family’ are less so. For instance, the family category covers toys and games, baby / maternity products, as well as items for pets. This is clear enough once you have clicked on the section, but perhaps these could have been split into separate categories. Aside from the top menu, you can also navigate through the categories displayed in the middle of the page, which do at least explain the contents of each section. Products recommended by users are promoted along the right of the page, while a tag cloud gives you an idea of the most popular items on the site. Unusually for an e-commerce site (or any website) there is no search box on the homepage. This seems a strange omission, as users that come to a site with a clear idea of the product they want, or if they cannot find it through normal navigation, then site search is the obvious option to try. There are search boxes in the other sections of the site, but I wonder if Tribesmart will lose the chance of more sales for the lack of a search box. Once you have selected a particular section, the links give you a few more navigation options, as well as displaying other users’ lists and featured products, while the tag cloud is more prominently displayed in this section. So far, as Tribesmart doesn’t have a huge range of products, these options are sufficient to browse the site or search for a specific item. I’m a big fan of feature filtering on e-commerce sites, as this allows users to browse for products more effectively, and allows them to narrow their choices and avoid having to look through huge lists of products, making a site more usable. This is a feature that is not currently offered by Tribesmart, and I think it will be essential once the range of products on the site is expanded. The product pages are smart enough, though more information could be offered for some products. In the case of a £170 iPod for instance, three lines of text is not enough; people want to know about size, battery life, and other features. More usefully, a breakdown of ratings from other users has been provided, as well as more detailed reviews of the product. As the site has just started, this information is all a bit sparse so far, but it could be a very useful resource once the site attracts more reviews and ratings. As you will be directed to another retailer to order the product, normal essentials of product pages like delivery charges are irrelevant here, but accurate pricing information would be useful. A ‘guide price’ is all that has been provided; why not list the prices on offer from different retailers so that people can choose the cheapest? Many of the products on the site have been added by its users, and you can download an add-on for both Firefox and Internet Explorer so that you can add products from other e-commerce sites. For example, I can go to Comet, find an iPod, and add it to Tribesmart, along with my rating, comments, and guide price (this explains the vague pricing on product pages). This is a useful way for the site to build up its product range, while ensuring that new products have at least one review, though how this works in terms of affiliate deals with retailers is unclear. This could also be useful when shopping on other sites, as this would allow you to access reviews and price information when viewing a product. Tribesmart has a very attractive design, much better than some other social shopping sites, and the site is easy to navigate around. It is a potentially useful resource for product reviews though, as long as the site can attract enough users and reviews to make it more a comprehensive resource for shoppers. Tribesmart has entered a crowded, competitive market, so it remains to be seen how it will manage this. Skyscanner is a website that allows users to search for flights by price and location; according to Hitwise, it has an 11.34% share of the UK travel search market. Recently, Skyscanner has been making a few changes to its website, aimed at improving the user experience.